Orangutan Survival Depends on YOU!!! The loss of the rainforest in Borneo & Sumatra is staggering. In December 2001, the Indonesian State Ministry of Environment estimated that between 5 million to 6 million acres of rain forest are destroyed each year. The United Nations Environmental Program called the situation an emergency in February 2007. Orangutan habitat is being lost at a rate 30% faster than previously thought, according to their report. Unless extreme action is taken soon, most of these forests could be gone in as little as 15 years, and wild orangutans along with them. Based on recent surveys and assessments, conservationists believe that only 70,000 orangutans remain in the wild (PHVA, 2017). Large-scale illegal logging is occurring at an unabated rate throughout Borneo and Sumatra in national parks like Tanjung Puting, Gunung Palung, and Gunung Leuser and other protected areas. Nearby regions of orangutan habtat are being converted to palm oil plantations that displace the great apes. In fact,the recent crisis in the sensitive Tripa Peat Swamps in Aceh, Sumatra paints an even grimmer future, with researchers predicting the remaining 200 orangutans have only a few years remaining, if the fires and conversion to palm oil continue unabated. The Governor of Aceh and the legislature of Aceh approved an ill-advised forest spatial plan that threatens the moratorium status on forest development and puts 1.2 million hectares (3 million acres) of protected forest onto the road towards conversion into palm oil plantations, mining operations, logging concessions, and a "spiderweb" of road development. The Tripa swamp would loose its protected status. The plan is now on the desk of the President of Indonesia waiting final approval. Sadly, if human beings do not significantly alter the course of their behavior regarding the orangutan and the forests they live in, critical biodiversity, consisting of rare endangered fauna, more than 40 species of mammals and 200 species of exotic birds, could soon follow to extinction. Our mission is therefore one of immediacy and global importance. 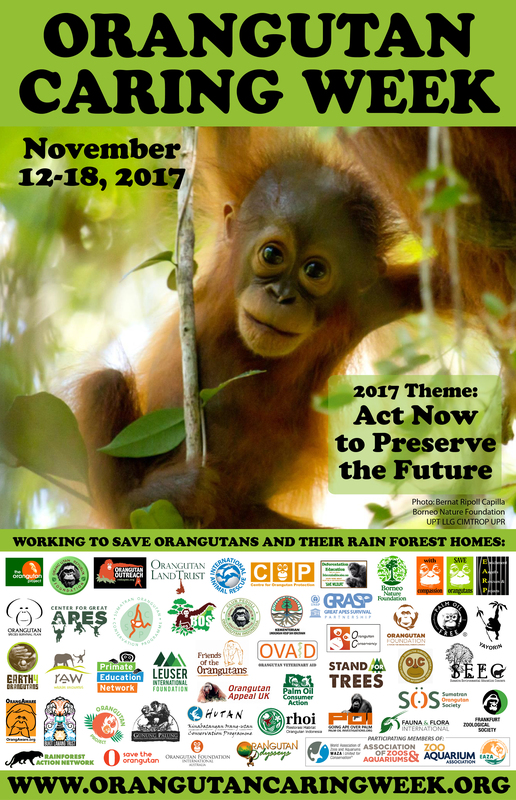 THEME FOR 2017:The theme for Orangutan Caring Week this year is "Act Now to Preserve the Future". Visit www.orangutancaringweek.com for more information as Orangutan Caring Week is now administered under World Orangutan Events (a consortium of several orangutan advocacy groups, including Orang Utan Republik Foundaiton)..
We need to express our concern and resolve through activities and initiatives that go beyond mere talk. For some people, learning about the issues for the first time may require discussion and discourse. However, for many people who have been hearing about this species' plight, talk may not be enough. Orangutan Caring Week is not only a great time to help people learn about the wonderful world of orangutans and their rainforest habitat, but it is the right time to encourage them to move to action so that they might be saved. What can you do to show you care and take action? Plenty! First of all commit to doing at least one activity. Whatever you choose to do make it fun, make it understandable but most of all make sure that it reaches out and motivates people to want to do something about the potential loss of one of our planets most beautiful species: the orangutan. 2. Educate with slide shows/videos, posters, brochures, and other media at local schools, church and civic organizations. Deliver a public lecture. Let people know about the orangutan-rainforest-Global Climate connection! And provide one or more calls to action. 4. Plant trees locally and support tree planting projects adjacent to orangutan habitat areas. 6. Give yourself, a friend, or a family member a Birthday party and donate the money to a support organization. 7. Put together photo essays/collages - let pictures tell the story/speak for you. 8. Write positive letters to influential leaders and tell them you think it is important that orangutans and their habitat be preserved. 9. Wear an orangutan t-shirt and let people know why they should care about the species' future.